New! Profit Accounting Guide - Buy Now! Give us two days and we'll give you a Profit-focused Manager! This guide is the written version of our popular Profit Accounting Academy. Why travel? Take 2 days off from work, stay home and go through this guide. The authors, Sandi Jerome and Nadine Epstein are available via email to help you with the exercises. The 100+ page guide tells you how to become a profit-focused manager, gives you exercises to do on your own, and a special hands on section to learn Excel better. Order today, and the guide will be emailed to you and you can plan your 2 days of learning. Price $895.00 Price includes 3 months free of DealerStar Tasks.Order and View Contents. DealerStar Tasks - become a Task-based Accounting Office Today! Started in 1995 by Sandi Jerome, the Super Controller Group is a collection of dealership accountants, professional trainers, CRM/BDC consultants, system administrators, and former office managers/controllers. With hundreds of combined years of experience, this group of talented "Super Consultants" can help you get your accounting office into this century by combining computer skills and best practices for streamlined accounting processes - or help you get better utlilization from your DMS system; ADP or R+R. The focus of the Super Consulting and Controller Group is to maximized profits for your dealership - and the heart of this is to create the reports that your departmental managers need to make profit generating decisions. Yes, the Super Consulting Group makes sure that your controller is doing all the required functions but we teach your controllers how to do them quicker and better so they have more time to become a Super Controller that participates in profit generating ideas. Our self-study Super Controller Guides teach your controller about the parts, service, and sales departments and pull this person out of the role of a "bean counter" into a full member of your management team. We are office manager and controller consultants and advocates but realize that nothing happens with a well-informed and supported sales and service staff. Our job is to bring everyone together and give them the tools they need to increase profits. "It was great to have the opportunity to learn from our peers. There were lots of ideas that I can use to make myself more profit focused as well as time savers! "Laura Pratt, Sam Leman Automotive Group. "I learned a lot especially in Parts and Service about gross profit and other great ideas that I will share with the dealer" Jose' - Bella Auto Group. "I like the concept of Profit Accounting and searching for the 'why'", Duke Mercer, EuroMotorCars Group "I like not only the savings techniques that will make us more efficient, but areas to look into that will put $$$ back into the dealership!" Corey Boucher, Port Lavaca Auto Group. "As my first Sandi Jerome seminar I was very impressed and enjoyed it a lot. Very imformative. Trish Covey, The Car Store. "I found out that there are many reports that we are doing using basic Excel that can be expideted by using the advanced Excel that I learned such as Vlookup and Pivot tables." Roland Frankel, Rosen Motors "I liked the Why approach instead of the What. It is very important to understand our operations and make it more profitable" Irvin - Bella Group. Today, Sandi Jerome is very, very busy bringing the newest (and best) DMS system to market, DealerStar. 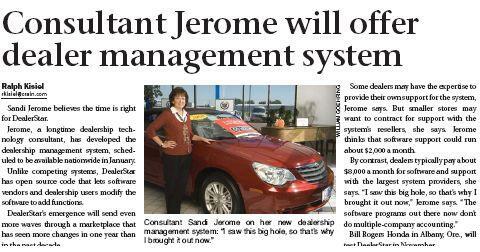 Sandi Jerome has over 30 years experience in the car business and was the perfect designer for a new DMS. She started in the parts department and then went into the accounting office. She was one of the first group of female F&I managers and eventually became a CPA, office manager and controller of a large mega store. She has managed a dealership group as CFO and been a fixed operations manager and assistant General Manager. She was the first editor of Digital Dealer magazine and a recognized industry expert on dealership technology. She consults on about eleven DMS systems including R+R and UCS and is a certified ADP consultant. She speaks most years at NADA on technology and her seminars are usually ranked in the top 10%. She has done the "Americanization" project for three DMS system from other countries, the most recent one was Quorum from Canada which was then selected as a GM IDMS, then DTAP provider. She has done product consulting for five DMS companies over the past 10 years and DMS sales training for three major DMS companies. Nobody knows how DMS systems should work better than Sandi - both as a user and designer. This project has been her dream. Visit www.DealerStar.com for a Free Test Drive and consider being an Investor, Reseller or Technology Partner. Make this YOUR dream too! Do you need more time in your day? Are you doing your office tasks the easiest way possilbe? This guide is over 120 pages and inlcudes over 300 tasks that Super Controllers should be doing Daily, Weekly, Monthly, Yearly, or during the Close and who should do the task by skill level. It also includes 3 free months to TasksMaster, a new module for DealerStar that helps you organize your tasks and assign to the right person plus the forms and spreadsheets that you need. To see Table of Contents, click on Products to the left, Super Controller 3. Super Controller 2 and 3 and 3 months TasksMaster - Save! Looking for the Premium downloads? Visit Gold Access to our past Newsletter database to view articles list and Premium spreadsheet download. Login with guest and password of guest to see the list. Click on Gold Access in the Other Products to the left to subscribe.